Judy Elvira Mathis Cooley, age 75, of Catawba passed away Wednesday, February 6, 2019 at Gordon Hospice House in Statesville. Born January 30, 1944 in Catawba County, she was the daughter of the late Larence Zero and Dolly Kirksey Mathis. 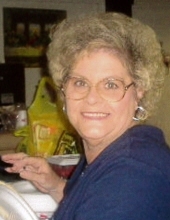 Judy was a member of Whitman Park Baptist Church in Mooresville. In addition to her parents, she was preceded in death by, her husband, Marion Estes Cooley, Jr., 3 sisters and 2 brothers. A memorial service will be held at 11:00 a.m. on Saturday, February 16, 2019 at Whitman Park Baptist Church in Mooresville with Pastor Gary Marshall and Rev. Marsha Joyner officiating. The family will receive friends Saturday from 10:00- 10:45 a.m. prior to the service, at the church. Memorial may be made to: Gordon Hospice House, 2341 Simonton Rd, Statesville, NC 28625. Burke Mortuary and Crematory in Newton is serving the Cooley family. To send flowers or a remembrance gift to the family of Judy Mathis Cooley, please visit our Tribute Store. "Email Address" would like to share the life celebration of Judy Mathis Cooley. Click on the "link" to go to share a favorite memory or leave a condolence message for the family.